One of the most important welfare activities of the ‘mission’ is the spread of God’s word through its publications, Books are the most illuminating means of spreading among people ‘shuddha gnana’ -pure knowledge about the essential nature of God and teach the millions of seeker how to perfect their spiritual means of ‘dhyana’ -meditation, ‘upasana’ -worship, ‘bhakti’ -devotion and ‘dharma’ -absolute faith in the supremacy of Lord Shri Swaminarayan and His Muktas. True knowledge alone can awaken the society and inspire the individuals to attain clear understanding about the nature and attributes of God and lead them to identify themselves with God. Books are the most powerful tools for achieving social, academic and spiritual progress of mankind. With a view to giving the readers some simple self – help books, the mission decided to publish useful spiritual books under the title : ‘Omnibeneficial Series’. A Publication Committee was formed on 26-9-1982. With a view to spreading the highest moral values and right understanding about the nature and attributes of the Supreme Lord Shri Swaminarayan among the economically weaker sections of the society it was decided to sell the books at a very low price – less than 50% of the actual cost. With a desire that eveiy home has these spiritual guides, it was decided to offer the publications at ‘seva-mulya’-subsidised price. The act of providing spiritual light through books has been a concrete step in the direction of leading mankind on the path of realising God. As the tree of knowledge began to grow and develop, Building No. 2 in Sureshvari Society was purchased to house the publication department. So far, the Mission has published 76 books of great importance. Many titles have been reprinted to meet the demand of the readers. 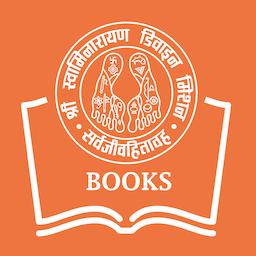 It is a matter of pride to state that Mission’s publication : Anadi Muktaraj Abjibapashri – nu Jivancharitra’ [A Biography of Abjibapashri] has received ‘Merit Award for Excellence in Publication’ from The Federation of Indian Publishers. This again speaks volumes for the quality of Mission’s publications. The other publications too have been received well by reviewers and readers. Like knowledge, the publication activity is a never -ending process. 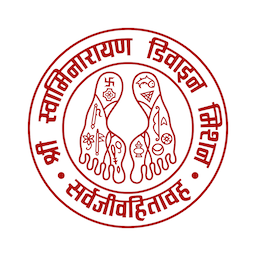 The logo showing the holy feet of Lord Shri Swaminarayan, its interpretation and explanation, Dedication to Bapashri in verse and the special introduction, ‘We believe’ are Pujya Narayanbhai’s own creations. Every work published by Shri Swaminarayan Divine Mission carries the symbol depicting the lotus feet of Supreme Lord Shri Swaminarayan. The image of the feet shows Sixteen luminous signs which stand for different attributes and attitudes of our Lord. 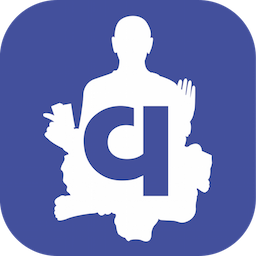 One who simply thinks of this symbol is automatically inspired to imbibe the redeeming qualities of God. Every published work is dedicated to Anadi Muktaraj Shri Abjibapashri. This is being done as an act of gratitude to the preceptor of preceptors for explaining to us the mysteiy of God’s manifest form and teaching us how to worship Him with irrevocable knowledge of God in human form. These publications are tokens of our love and sense of gratitude offered to a brahmanised saint, a divine teacher who helped us foster genuine love for God. This will keep intact the bond between the spiritual aspirants (Sadhak) and the preceptor and keep the flame of love and devotion for ever burning in our hearts. Dedication is an offering of our devotion which by Bapashri’s divine grace will continue to grow stronger with the passage of time. (We Believe) This Preface helps the reader understand the chief objective to be achieved by publishing this inspirational series of books. Every book, published by the mission carries a beautiful picture of Supreme Lord Shri Bhagwan Swaminarayan to remind the reader that no work should be begun without invoking the blessing of our God. It is His power alone then can help us accomplish our desired goal. You will also find a picture of ever inspiring Bapashri. 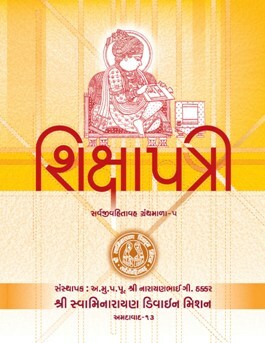 In response to a suggestion made by Acharya Shri Tejendraprasadji of Narnarayandev Gadi, Ahmedabad and a committee of scholars and saints, Muktaraj Shri Narayanbhai had written an article, entitled: 'Sarvopari Bhagwan Shri Swaminarayan Ane Vishwa Dharma' for a special number of the magazine: 'Bhagwan Swaminarayan'. The article contained a brief survey of the life and works of Shreeji Maharaj and a critique of Swaminarayan Dharma as a world religion. 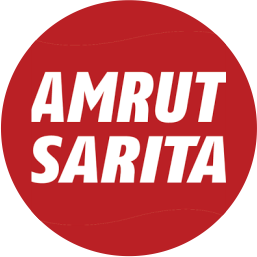 Later on Muktaraj expanded this article into a book and published it under the same title. He undertook this project to remove misconceptions about Swaminarayan philosophy and its founder and make people understand and accept rationally the ways of God to secure eternal bliss through the worship of his manifest form. This short but not small booklet will convince the reader that here is a religion with universal implication and not a narrow sect. This booklet offers us a glimpse of Anadi Mahamuktaraj Shri Abjibapashri who possessed all the attributes of Shreeji Maharaj and who dwelt on this earth by the exercise of Maharaj's will to remove ignorance and redeem the souls. This booklet helps us identify the divine qualities of an Anadimukta and understand the spiritual state of Anadimukta. (Prayer) This booklet treasures immortal hymn celebrating the divine attributes and actions of Shreeji Maharaj. It also teaches us how to attain His bliss and establish rapport with God through TJpasana' - prayer and worship with 'dasabhava' - sense of subservience. This was composed by Shreeji Maharaj's contemporary saint His Eminence Anadimukta Sadguru Shri Nityanand Swami. Shreeji's contemporary, His Eminence, Anadimukta Sadguru Shri Shatanand Muni has composed this hymn which enlists 108 names of Maharaj revealing His divine, redemptive attributes. This Jana Mangal Stotra (Hymn) if recited with deep devotion brings peace, prosperity, fame, divine favour and helps the " devotee attain salvation. It can work miracles. 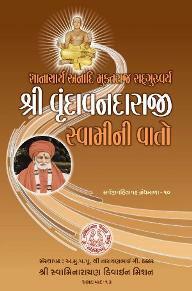 This miraculous work has been translated into Gujarati to enable the devotees who have no knowledge of Sanskrit. No body should be excluded from its recitation. Lord Swaminarayan Himself composed 'Shikshapatri' containing the code of conduct and moral and religious duties for His disciples and devotees. 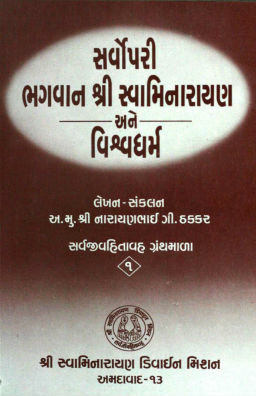 This booklet also contains a Gujarati translation of 'Shri Harikrishna Mahimashtak' (Eight Devotional verses) composed by Shreeji's contemporary saint, Param Yogivarya Anadimukta Sadguru Shri Gopalanand Swami. This book includes Jana Mangal Namavali, modes and methods of performing different Manasi Pooja [meditation] and description of the Lord's attributes. Anadi Muktaraj Sadguru Shri Gopalanand Swami's brief life-sketch and the moral tales packed with wit and wisdom leading the seekers on to the spiritual-path are an important aid to the realization of God. This book presents the tales with necessary annotations and explanations and classification according to themes and subjects. This is a collection of inspirational thoughts and utterances of Anadi Mahamuktaraj Shri Abjibapashri. It also contains his views on the life of Shreeji Maharaj and His* Muktas re-affirming their divinity and their spiritual glory. One can easily master the art of establishing unbroken rapport with the luminous form of God. Known as "Walking Brahma Yagna" in the Satsang fellowship, the dearest disciple of Bapashri and a recepient of Shreeji Maharaj's choicest blessings, Anadimukta, Param Pujya Somchandbhai was a 'Karma Yogi'. His life and his sayings were as important and inspiring as those of other God-realized Saints. This book is a collection of his gems of spiritual wisdom and letters providing spiritual guidance to devotees. This book inspires the readers to act without egoism or desire for reward- the surest means to earn the pleasure and favour of God. Compassionate Preceptors : Blessed are they who know them. Justifying the title, 'Blessed are they who know them', this book contains the lives of Sadgum Shri Ishvarcharandasji and Sadgum Shri Vrundavandasji; the two great seers who were dearest to Bapashri and spiritually nearest to the heart of Shreeji Maharaj. Their lives have special significance these days when there is darkness all around. They reveal the qualities of love and devotion and teach us to master the art of living a meaningful spiritual life. Here is an inspiring collection of the most memorable tales narrated by Sadgum Swami Shri Vrundavandasji. The book contains immense store of his tips that will make one's spiritual journey easier and attainment of communion with God faster and surer. Shreeji Maharaj's contemporary 'Nand-Sant' poets have made our lives richer by offering us immortal devotional songs. They were music-makers in the real sense of the term. These songs carry the vision of God in His Manifest form. Here poetry is combined with spiritual passion. One can sing them all the way to Eternal Brahman- Lord Shri Swaminarayan. Bhakti is said to be the easiest way to God. This book will satisfy the seekers as well as the lovers of pure poetry. The book contains the occasion of the poem as well as its interpretation. This book is a rare collection of tales told by Swami Shri Tadrupanandji who was a disciple of Shreeji Maharaj's contemporary poet-saint Brahmanand Swami. It covers the period when our Lord Shri Swaminarayan visited Muli and its surrounding area. The incidents depicting the redemptive actions and attributes of Shreeji Maharaj and His preaching will inspire the reader to contemplate deeply and arouse in him desires for divine visions of God. This will enkindle 'prembhakti' in the heart of the reader and make him worship God with knowledge of His glory. We have already referred to volume No. 8 which contains the sermons delivered by Anadimukta Param Pujya Somchandbhai. In response to the request made by some devotees we have brought out a separate book which carries letters from Somchandbhai to his disciples. These letters contain philosophy in the most intimate and simple language. 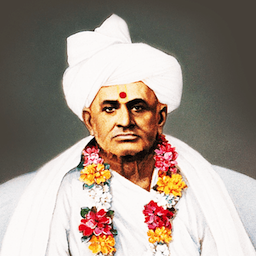 Shreeji Maharaj's heir and head of the Narnarayan Gadi, Ahmedabad, Param Pujya Dharma Dhurandhar Shri Ayodhyaprasadji's life and devotional songs written by him are unique and inimitable. His songs dripping with love divine can even today drench the devotees with devotional rain. Mere reading of this book can arouse love for God in the hearts of the devotees. Sadguru Muni Swami has written a lucid and simple commentary on certain select verses from Shikshapatri. This spiritual guide should be a part of our 'nitya patha-pooja'. It's a rare divine gift to us from one of our learned preceptors.